Baccarat as the card game is considered to be the game with the simplest set of rules. That is partially the reason why most new online casinos offer it at launch, along with slots and roulette. However, every player should know them in order to be an experienced in this particular game, if it is the most favorite among the other online gambling games. Baccarat has the easiest rules from all the other gambling casino games. It has many relations to the Blackjack card game, but the rules are not so complicated. Baccarat is usually played in different casino section. The size of the table is approximately as in craps. There are 3 dealers and can be up to 14 or 12 players at a table. There are only two bets available in Baccarat: bankers or player's bet. They are called Punto or players and Banco or banks. Standoff is rarely used. Some casinos offer players to deal the cards, the other casinos have a dealer to deal the cards. 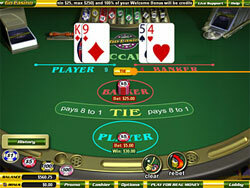 In best online gambling, cards are being dealt automatically with the help of a virtual dealer. The game is played from a shoe just like the Blackjack. It is played by means of 6-deck or 8-deck shoe. With all face cards, alongside tens have no value in Baccarat. The cards lower than 10 are calculated at their face value. 1 is the value of Aces. Suits do not really matter. In this game only single digit value is working. In any double digit count is calculated by dropping the left digit, for example, 15 is calculated as 5, 25 -the same as 5. When either the bank or the player has total 9 or 8 on the first cards, no cards are to be drawn further. The outcome is a natural hand and it is over. When the total player's is equal or less to 5, the player draws the third card. When the player quits drawing the third card, the hand of the bank can stand on 6 or even more, takes this third card on the total 5 or less. If the third card was taken by the player, then the following rule will do. When the total of the bank is 2 or even less, the bank draws the card, no matter, what the player's card is. If the total banker's is 3, the bank takes the third card, if the third card of the player is 8. If the total is 5, the third card is drawn by the bank, when the player's third is 7, 6, 5, 4. When the total is 6, then it draws a card, if the third card of the player is 6 or 7. In the case if the total of the bank is 7, the bank stands.